“We came to the UK and claimed asylum at Heathrow Airport. We got on a plane from Pakistan. We were sent to Leeds for six months. My wife and I and our two children aged 10 and 11. We flew from Pakistan because there was a problem with some of the people there because of my beliefs. I am a Christian. We were in an Induction Centre in Leeds where we were educated about the system. Housing etc was worked out for us. So, after six weeks we were sent to Hull. Then Asylum Seekers had no choice in where they went to live. Initially we were housed in a flat in Coltman Street which was near a Church of England. We enjoyed living there for 18 months. Chris Hembury was the first person we met. (Hull Youth for Christ). It was dark in the Winter. We looked for a church- St Matthew’s. When we went in, Chris Hembury was in there. We had a good relationship with him and the Baptist and Catholic Churches in the area. 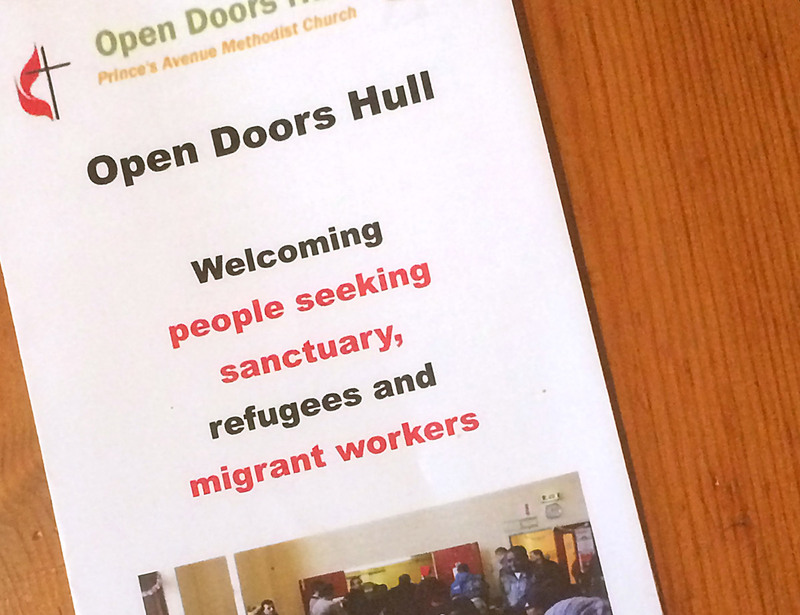 “People recognise the work of Open Doors in a positive way. I am happy that the majority of our clients feel satisfied with the support we provide. Bashir is the first point of contact. He co-ordinates and passes on and/or delegates. “There are many memorable things. So many good things. In this job, I have assisted people in difficult situations and sometimes have to say ‘no’ and may cause stress to them. When you work with people, it makes you happy. Bashir is happy in Hull. It is important to Bashir that Hull is a City of Sanctuary. This and a Foodbank was brought to Hull by Open Doors. They were the first people to bring this to Hull. Through Open Doors, Bashir has made himself known to the Church Networks. He is known to people in key positions e.g. Bishop of Hull, The Arch Deacon. The project is also respected by the Lord Mayor etc. The project has helped with other organisations and has a healthy relationship with the Church of England including Archbishop Sentamu and the Catholic Bishop. Bashir feels that Bishop Alison is very down to earth, humble, brilliant. She gets involved with people. Bashir is also involved with the Bishop of Middlesbrough, Interfaith and inter church networks. He is also involved with the Diocesan Caritas Board. The previous week to this, interview, he had been to see the Bishop of Middlesbrough. He is happy, because Open Doors is doing good work.